Phil Kubicki's intense interest in guitars began when he was 13; by the time he was 15 he was building his own classical guitars. In 1962 he went to work for Fender Guitars in Fullerton, California, as one of the first employees in the acoustic guitar division. He studied woods and their different effects on guitar sounds. In 1968 he joined Fender's research and development department. He made prototype guitars and special-order guitars for musicians like George Harrison and Jimi Hendrix. Phil's research culminated in the introduction of Fender's LTD and Montego hollow-body electric guitar lines. 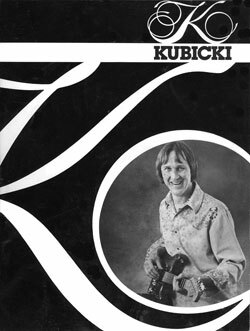 Phil left Fender in 1972 and spent five years pursuing his own acoustic guitar designs and studying further the mingling of wood, music and electricity; Albert Lee, Joni Mitchell, Jim Messina, Eric Clapton, and John Sebastian are among the owners of Kubicki instruments. Today Phil and his craftsmen produce replacement guitar bodies of elegant and exotic woods, guitar necks of maple, ebony, and rosewood, and an exciting new line of mini-guitars in his Santa Barbara factory.